Inequality Is A Growing Pox Upon Our Economic System! Unfortunately considering current trends we should not expect improvement in economic equality. 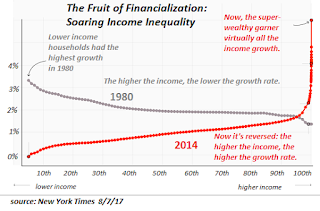 In America, wealth inequality has soared in recent years and now stands at the worst it has been during the entire U.S. post-war period. Studies show that the U.S. middle class has been more “hollowed out” than originally thought in terms of income by manufacturing jobs and any gains made by the lower-middle class were sharply reversed after 2007. Using certain data we get the picture that racial economic-equality disparities are as bad as they were before the civil rights era. The fact is, driving a decent car doesn't make a person middle-class or economically equal, especially if they are up to their eyeballs in debt to do so. 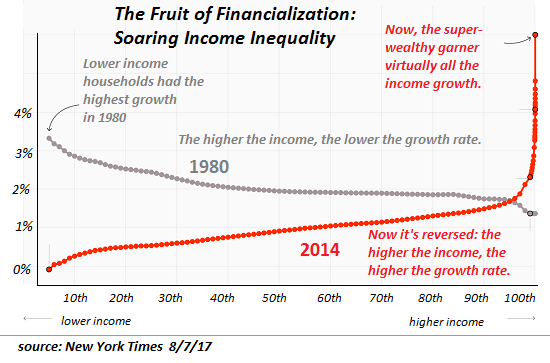 Economic inequality is not only a profound social and economic issue but flows into forces that affect financial-market stability. The saying "Talk Is Cheap" comes to mind when we search efforts to address the growing level of income polarization because while many people voice concern this thorny emotional problem is neither easy to solve or correct. A huge part of the problem is that those who really wield the power to bring about change, in reality, are often sheltered from the pain it causes and out of touch with what many people are forced to go through every day. Because of this, in truth, they see it as a low priority, consider other matters as always being more important or simply do not understand the nature of this beast. The fact it is so difficult to easily locate current charts, such as the one above, speaks volumes as to how this remains a back-burner issue. In a piece titled; "The Morass That Swallowed the Middle Class" Matthew Shaw delves into how much of the inequality debate focuses on the gains of “the 1%,” and less attention has been paid to the economic well-being of what is broadly termed the middle class, which is all too often just lumped into the other “99%.” Of course, much of this centers around just how out of touch our "professional elite" are with the population and this spills over into the economy. By our professional elite, I refer to those who make the rules and their minions, their aids, the academics, the financial institutions, economists and the media, all of which have tied their wagon to the status quo. Conflict and corruption also enter into this picture as we often find that even those setting the rules also tend to want a bigger piece of the pie. There is a way to reverse the trend. Helicopter money. Not UBI which is a continual handout, but a one time gift of cash to everyone. If capitalism is too tight to do it then socialism will be the unfortunate option. I remember the old commercial, pay me now or pay me later. Capitalism would do well to try to prevent socialism with helicopter money. Bruce Wilds is a general contractor that owns real estate in the Midwest, his holdings include apartments and office complexes. He is anchored to reality and the economy as he maintains, designs, and leases buildings. This has made him keenly aware of rapidly changing lifestyles, this blog incorporates many of the experiences and knowledge from his hands-on business style, extensive travels, and studies of history, politics, and economics. Unconventional, and a bit of a rebel, Wilds is also the author of the book "Advancing Time", the book focuses on how the ever-quickening pace of change impacts today’s society and the massive challenges it creates. He feels that it is crucial we understand that we are living in a unique era the likes never before experienced by past generations. This is especially true when it comes to our current "take no prisoners" world of economics.